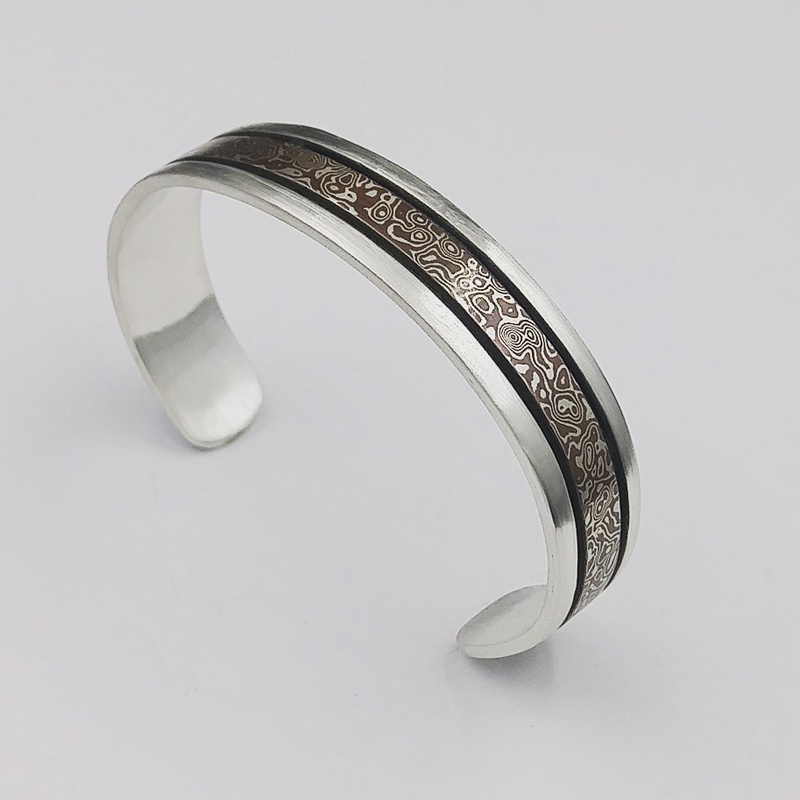 Mokume and sterling silver bracelet. This mokume and silver pendant measures 3 inches long and is 1 half inch wide. 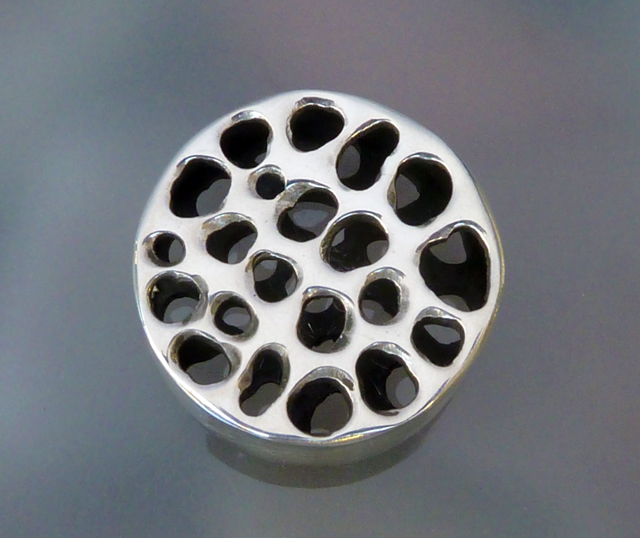 This Sterling silver pendant measures slightly over 3 inches long and is a half inch wide. I am incredibly busy getting ready for this show. The Pueblo Grande Museum recognizes and testifies to the importance and magnificence of Native American culture in the Southwest and America. The Pueblo Grande Museum Indian Market is a celebration of Native arts and culture. The Indian Market is a juried show, so the work presented is not only authentic, but goes through a panel of judges before it is accepted. I am really excited to have been invited to be a part of this show! The Pueblo Grande Museum Indian Market features top American Indian artists with paintings, sculpture, jewelry, baskets and much more! Admission to the Market is $5 and includes admission to the Museum with free admission for children under 12.There will be a variety of music and dance performances, artist demonstrations and traditional American Indian foods. If you are in Phoenix, come check out the show!! I would love to see you there. 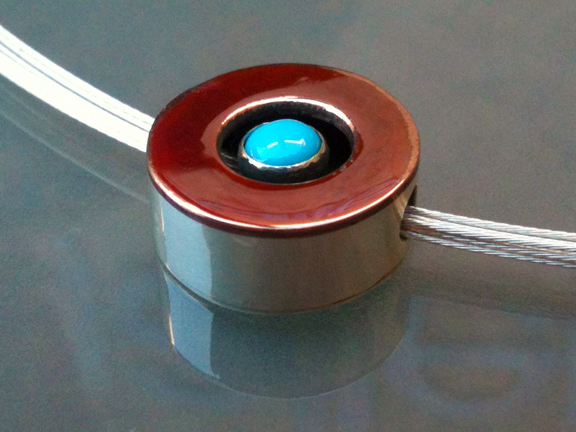 Turquoise emerges from inside this pendant like a secret underground pool. The hand-hammered brushed silver body is very earthy. This is a hollow form, the necklace runs through the pendant, leaving the line of the design completely uninterrupted. May be worn alone or with other pieces. 3/4 inch diameter, 1/4 inch deep. Signed on the back. Hand-crafted, one-of-a-kind. 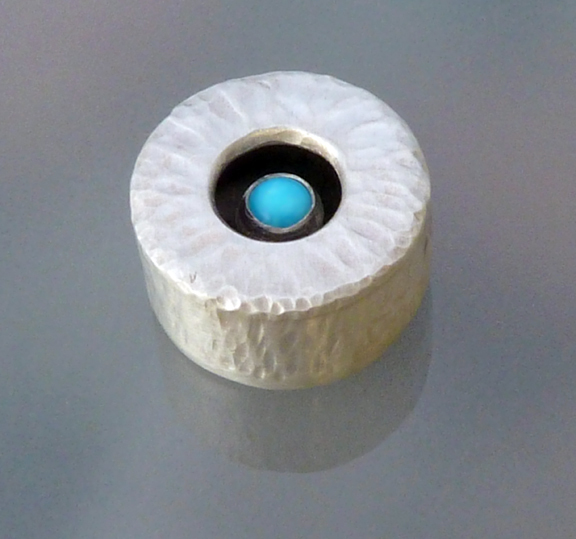 Fine silver and turquoise. Part of the Tao Collection. This piece is at Zen Mountain Gallery at 515 Main Street, Jerome, AZ. 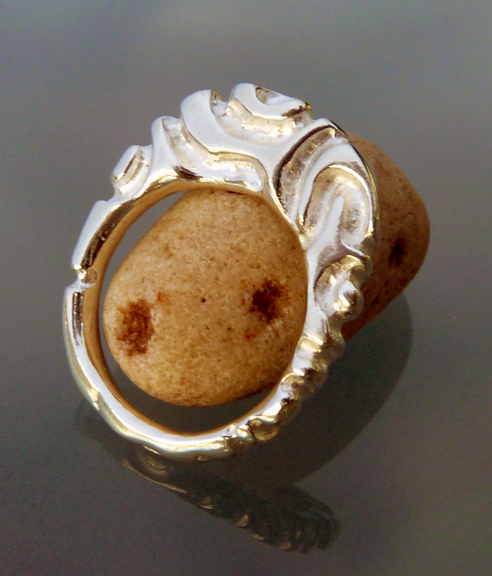 Signature design, hollow form hand-carved polished silver pendant. Seed represents pure potentiality. Lotus is a beautiful flower that rises out of the murkiest mud – and – it also represents the individual chakras of the Hindu chakra system. The full moon is potentiality realized. One inch diameter, one quarter inch deep. Signed on the side. One-of-a-kind. 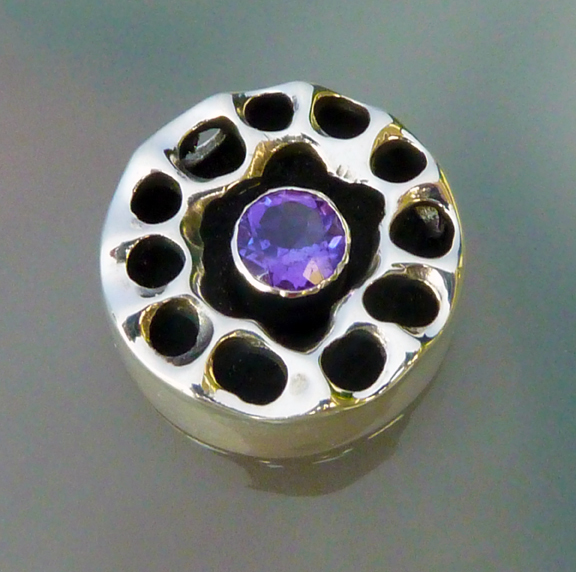 Brilliant faceted amethyst in the center of a silver lotus seed pendant. Stunning! Amethyst is connected to the Crown Chakra, or Sahasrara Chakra. Sahasrara means thousand petaled lotus – it is the chakra of pure consciousness, the connection to the Divine. Hand-carved. One-of-a-kind. Sterling and fine silver. Shadowbox design. Signed on the back. 5/8 inches in diameter, 1/4 inch deep. 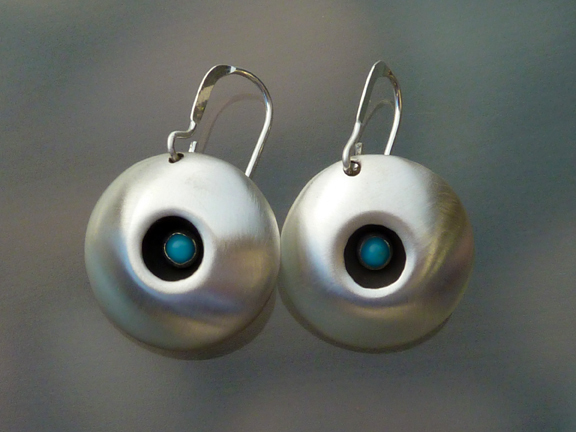 Entirely hand-crafted, these shadowbox earrings are smooth, clean, and modern in brushed fine silver with turquoise. The silver has a soft, warm sheen nestling vibrant turquoise. Modern classic! Earrings are approximately 3/4 inch diameter, up to 1/4 inch deep. Hand-crafted. No two pieces are exactly alike. Signed on the back. This hand-carved silver ring fits comfortably on the finger, with beveled inner edges and rounded squared sides while the top of the ring rises gently above the finger. The carved silver catches the light, the fluid curves flowing like water. Comfortable enough even for people who prefer bands or rings that are flat and close to the fingers. Perfect for when you want a little something “extra” while keeping your look simple and chic. This ring is approximately a size seven. One of a kind. Polished sterling silver. Copper that has been highly heated to bring out it’s fiery red color contrasts with clear blue sky turquoise set in a beautiful shadowbox design with polished fine silver. Bold and beautiful. Fun and elegant! May be worn alone or strung with other items. 5/8″ diameter, 1/4″ deep. Signed on the back. Hollow form. (Made for a cord to run through the body). Hand-crafted. One-of-a-kind. to purchase click here . . .